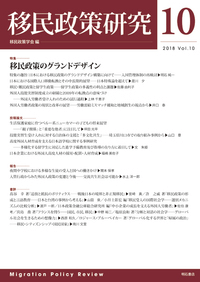 Please note that reports and report summaries are available only in Japanese. Via Subway: Take the Meiko Line to Hibino (Exit 1) OR Meijo Line to Nishi-Takakura (Exit 2). Shiratori Gakusha is a 15-minute walk. There are no stores where you can buy lunch near the university. Please try the convenience store or super market near Hibino station. Reception 18:30-20:30 Cafeteria, 1F, Akebono Bldg. Due to construction work, train services running between Mitaka and Tachikawa on the JR Chuo Line will largely be suspended from approximately 14:15 to the last train on Saturday, May 19. If you plan to arrive at the conference during this time, please take the Keio Line from Shinjuku and transfer to the monorail at Takahatafudo. Considering the Issue of Statelessness before the Introduction of the "Residence Card"
As the cafeteria is closed on Sunday, May 20th, please bring your own lunch.